Eek. We are finally moved from blogger to WordPress. New theme, new platform and new everything. And while I try to learn the ropes on this, there might some hitches and delays here and there. First post published! The feed got refreshed, so if you subscribe by email, I apologize for the extra email with the recent posts. The subscription mails have now returned to normal frequency ie. one email per post. I plan to change it to a weekly newsletter in the future to reduce the number of mails. 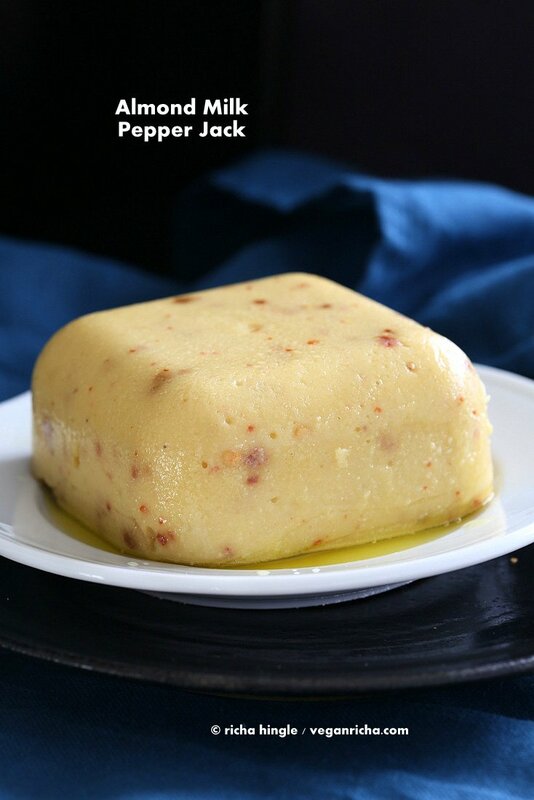 A quick post today with this Easy Vegan Pepper Jack Cheese. This vegan cheese has almond milk, starches and agar to thicken and stretch, Chickpea flour for taste and texture and voila! You can also make this with coconut milk or cashew milk. The cheese with cashew milk will be whiter on melting. 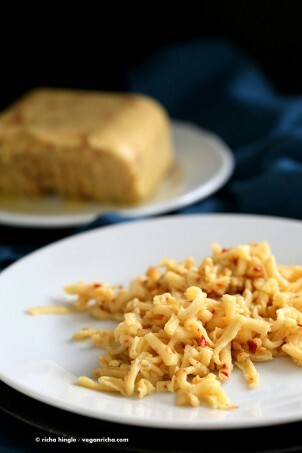 The almond milk cheese shreds with a large grater! Use it on a Pizza or grilled Sammie. Even writing up the post is a learning process. The dang editor. Any who, while you all are here, please browse around the site, report any issues in the comments on the post, or on my Facebook page and let me know what you think :). The site move was accomplished with the least amount of my hair graying with the help of Rika (veganmiam.com). Rika under Rika Studio also does web design, WordPress customizations or transfer and consulting. She is still helping me out night and day with the learning curve! I cannot recommend her enough! Some Cashew Mozzarella made into Mozzarella Sticks! This Pepper Jack shreds! If you want to make it really hard, try pomona’s pectin like this recipe. Grease a glass container with extra virgin olive oil and keep ready. In a bowl, whisk 1/2 cup almond milk with the starches, chickpea flour, nutritional yeast, extra virgin olive oil, vinegar, lemon juice, spices and salt. In a pan, add 1 cup of almond milk and agar powder and heat on medium heat, Bring to a rolling boil and cook for 4 mins. Reduce heat to low and slowly add in the almond milk starch mixture from step 1 and mix. Increase heat to medium and continue to mix and cook for 4 to 5 minutes. Add in the pepper flakes and fold in. Carefully (the mix will be hot) taste and adjust salt, tang (lemon juice) and spice. You want it to be slightly more saltier, spicier in the liquid state. Take off heat and pour in a well greased glass container. Let set in the refrigerator for at least an hour. Use a large grater to shred and use. Note: ** if using agar flakes, use 2.5 to 3 Tbsp of the flakes and cook with the almond milk for 12 to 15 minutes in step 2 and mix to completely dissolve. for variations: Use other plant milks like cashew milk or coconut milk. 1. Grease a glass container with extra virgin olive oil and keep ready. In a bowl, whisk 1/2 cup almond milk with the starches, chickpea flour, nutritional yeast. extra virgin olive oil, vinegar, lemon juice, spices and salt. 2. In a pan, add 1 cup of almond milk and agar and heat on medium heat, Bring to a rolling boil and cook for 4 mins. 3. Reduce heat to low and slowly add in the almond milk + starch mixture from step 1 and mix. 4. Increase heat to medium and continue to mix and cook for 4 to 5 minutes. 5. Add in the pepper flakes and fold in. Carefully (the mix will be hot) taste and adjust salt, tang (lemon juice) and spice. You want it to be slightly more saltier, spicier in the liquid state. 6. Take off heat and pour in a well greased glass container. Let set in the refrigerator for at least an hour. Use a large grater to shred and use. Note: if using agar flakes, use 2.5 to 3 Tbsp of the flakes and cook with the almond milk for 12 to 15 minutes in step 2 and mix to completely dissolve. Shredded up on a Pizza below. No that is not hair, its just onion skin. Pizza recipe here. Hi Richa, this is a weird question but, is this cheese healthy? I say this because of the starchs, I don’t know how healthy are this types of flour, could you help me with this info? Hi Elizabeth, I have not studied nutrition, so its hard for me to say much. healthy is a term open to many interpretations. This cheese gets used over multiple servings depending on how you use it. It has almonds, agar and whole chickpea flour which is a fabulous thickener, and some starch for texture. You can also make cheese with no starches like cashew cheeses but then the texture would be different and it will be a spreadable cheese, and not meltable. The texture is near-perfect. The taste, however, wasn’t really what I was expecting. There’s something in there that completely puts me off. I first thought it was the almond milk, so I made another batch with unsweetened soy milk. But I still didn’t like the taste. I might try again without the apple cider vinegar (maybe take more lemon juice instead) and some nutritional yeast, which can often save cheesy recipes. Or could it be the chickpea flour? I’ll keep experimenting because I like the texture a lot. hmm. Can you tell me more about the taste? There could be many reasons. The extra virgin olive oil gets rancid sometimes,old vinegar can add quite a stale flavor profile. It can be chickpea flour as well (if it taste bitter or raw floury) if the flour did not fully cook through, simmer a few minutes longer. Chickpea flour once cooked is mellow. You can use regular flour but the texture is different compared to chickpea flour. With the leftover cheese, you can make cheese sauce for pasta, melt the cheese with some non dairy milk and add more nooch and spices and herbs, taste to fix the flavor. Hello! When I make this recipe, the flavor is perfect!!! However, when it cools, it adopts a very funny taste; I’m thinking it’s the thickeners? I am using cornstarch, arrowroot, and agar. Do you have any advice on that? Thank you for your wonderful blog and so many delicious, healthy recipes!!! It could be either of the starches as they have their own flavors that might be detectable depending on your taste buds. Could also be chickpea flour, it tastes bitter raw-ish if not cooked long enough to cook fully. It can also be the almond milk if you are using a brand almond milk. some brands add many gums and thickeners which alter the flavor/texture on being heated for long. What is the funny taste closest too, like a spoilt nut, flour, is it bitter ? You can possible taste the tiny amounts of the starches, flour etc ingredients to figure out what the cheese taste is close to. You want to use a small container else the block will be too thin. I used unsweetened almond milk from a carton, I don’t remember which brand. Homemade should work well too. It might have a stronger almond flavor, so adjust the seasoning to mask it. AHHHH this recipe just changed my life. I just made it today and it’s incredible! Your are a vegan GENIUS. Thank you! Could this be made with soy milk instead of almond milk? Hi from Norway! I found this recipe last week and was super excited as it looked amazing 🙂 Ordered the ingredients I didn’t have and finally tried to make it this week. Yesterday I made pizza but the cheese didn’t melt. It did taste good though, so it’s definitely a good option for pizza, but I wondered what went wrong. (The picture of your pizza looks amazing!) I have only tried to use it once, so I don’t know… but was thinking about temperatures. Do you know if a lower temperature would maybe help? Thanks anyway for a fabulous recipe! The cheese melts at high temperature. If it didn’t melt, then it could one of 2 things. The temperature in the oven didnt get high enough or the toppings were quite cold and needed more time to heat up. Since the cheese is on the toppings you used, the cheese would also need more time to heat up. You can broil the pizza for a minute or so to help the cheese melt. The cheese melts and then sets again as the pizza cools. It sets faster than dairy cheese. So it could have melted and set already when you sliced the pizza. You can add some more oil to the cheese recipe, so it stays melted a bit longer. Let me know how it works out. Thank you so much for your reply. I have tried twice now, one time using the grill function and one time just normal heat in the oven. The cheese did not melt, it looked the same as before putting the pizza in the oven, just that the edges of the cheese got burnt (still tasted great though!). The pizza sauce, toppings and cheese came straight from the fridge though, so it was all cold. Thanks for all your tips, next time I will add more oil and also let the topping heat up a little before adding the cheese. Hi again! I have tried to make this cheese a second time now. I added more oil, and this time the cheese melted! Hurray! Delicious. The only problem was that this time the didn’t really harden in the fridge, so I wasn’t able to shred it. It was more like a thick cream cheese. Would you happen to have any ideas to fix this too? 🙂 Maybe more agar? More starch? I am so grateful for this recipe, I enjoyed my pizza soo much! 🙂 it depends on the oil. some oils stay liquid when cold so too much oil would keep the cheese from setting well. you can add more agar since agar also has variable results depending on brand. you can also spread the cheese mix on a greased baking sheet and let it set. once set, you can make thin slices to use as shreds. There’s a shortage of agar, worldwide. Is there anything that can be used in its place? Hi there! I am really enjoying all your amazing recipes and was so excited to try to make this cheese! Unfortunately as I was reading it I accidentally admitted the nutritional yeast as I didn’t see it in the recipe directions! Only in the list of ingredients! I tend to be a step-by-step sort of cook and because I didn’t see it in the written directions I skipped right over! We shall see how it comes out! Going forward when would I add the nutritional yeast? Did I somehow miss it in the directions? Thank you so much for your guidance! I have been vegan for four months now and your recipes has really helped make it a wonderful journey! Ah, yes i missed mentioning it in the directions. thanks for catching that. The ingredients usually are used in the order listed, so it is added after the chickpea flour and mixed into the almond milk at step 1. Updated the recipe now. The cheese might not taste very cheesy. 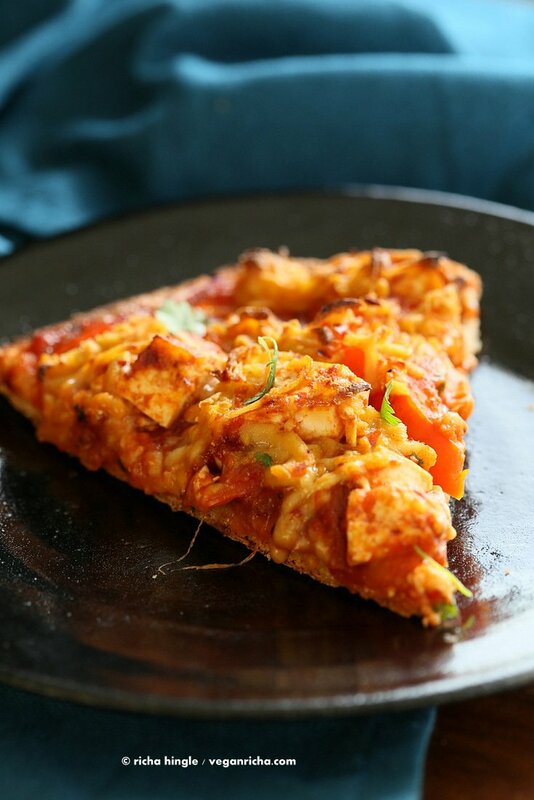 You can use it on a pizza and sprinkle some nutritional yeast over it once it is melted. WHere can I find chickpea flour? I search Thrivemarket.com and Amazon.com, neither have it! its called garbanzo bean flour on some sites. I am not sure why it burned quickly on the pizza. What ingredients did you change in the recipe? That has never happened to me with this cheese even when i broil. Hallo, ich glaube, es lag an der Stärke. Ich habe zum ersten Mal Maisstärke genommen. Der Käse hat aber so gut geschmeckt, dass ich oft wieder gemacht habe. Ich habe aber Tapiokastärke und Pfeilwurz genommen. So hat sehr gut funktioniert! Besonders mit zusätzlich Bärlauch drin ☺️danke und es tut mir leid, wegen meiner Aufregung am Anfang. Es ist eh sehr schwer mit Google Übersetzer Rezepte zu verwirklichen ☺️dein Buch habe ich auch schon gekauft Richa! Bitte so weitermachen! Liebe Grüße! Awesome! I know the translator is weird. If you translate it correctly yourself, please do leave it in the comment here so others who want the translation can follow it! The consistence and the flavor of this cheese is awesome! It’s the only veg cheese I’ve made more than once because it’s really good! Many others are just “meh”. I replaced some jalapeno to the chili flakes the second time, I now can’t stop eat it 😀 It also “melt” in a way other homemade cheeses don’t! REALLY THANK YOU for sharing! I used agar agar powder and for the corn- and tapiokastarch i used arrowrootstarch. An answer and suggestion would be great! I think all arrowroot doesnt work as well. You need a combination of starches. If it is too liquidy creamy, then the agar powder either did not dissolve well or did not activate well or its too old and has lost its gelling capability. With the agar, the cheese should generally set a bit to somewhat soft state even with the changed starches. The recipe makes a set cheese which is soft and will not shred like a hard cheese. It shreds into soft shreds that can be used over pizza. You an freeze it for a bit to harden for shredding. Maybe the soft consistency is what you mean by creamy? Hmmm… let me think of a comparison for the texture… it was more like pudding, when still hot and “liquid” after boiling it! I guess i will try it with a starch combination than next! … is there one of the starches you would recommend the most for combination with the arrowroot? Or just stick with cornstarch + tapioca and not using the arrowroot at all? Hi, I was wondering which Almond milk I should use? I buy the Almond Breeze brand. Should I use the original or unsweetened? Thanks. I just made a batch using pectin. I discovered too late that the brand I was using was sweetened. However, it still tastes really good! I’ll get the right kind of pectin next time. I made this cheese yesterday and it was soooo amazing. I would like to give it a 6 out of 5:). My lil son who is allergic to dairy couldn’t tell the difference and gobbled the entire pizza (which was also GF and Corn Free). However, I didn’t realize nutritional yeast was different and added instant yeast. Anyways I have already ordered nutritional yeast and plan to try all your cheeses:). You are our hero!!! Thanks and keep posting:). This is awesome! 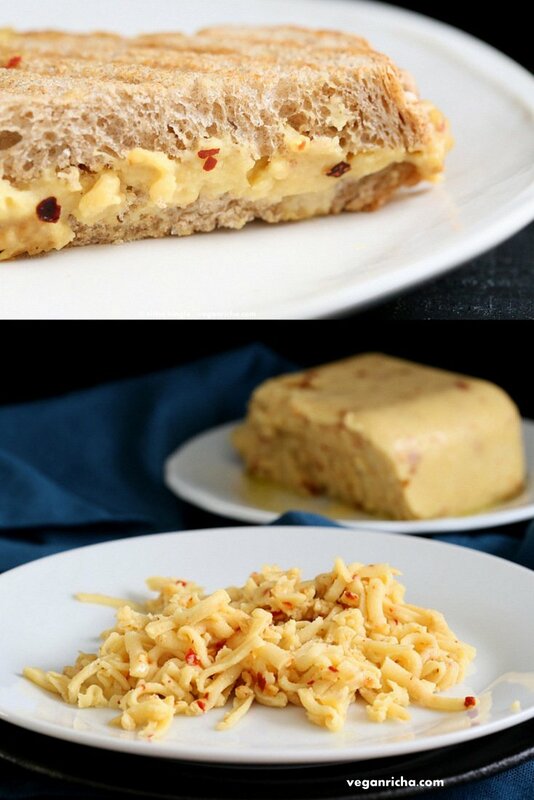 Yes, definitely use nutritional yeast for cheesier flavor to add to any creamy sauces, cheeses etc. I made this cheese today and wondering if there is a way to make it so it’s not so soft? I found it hard to grate without it becoming too soft and somewhat mushy I followed the directions exactly as stated, so just a little unsure. double the agar powder and try. sometimes the agar powder depending on brand needs additional amounts for similar effect. Thanks! I will try doubling the agar powder and can’t wait to try your other recipes, they look great! Just made this cheese (and the bbq sriracha pizza as well!) and they were absolutely delicious–thanks for sharing these wonderful cheese recipes! I did notice however, that my cheese didn’t seem quite as hard as yours–it didn’t shred as easily and also didn’t melt as nicely as yours–do you have any thoughts as to why this might have happened? I’ve tried this with unsweetened cashew milk and a teaspoon of white miso and it came out fantastic. Question – do you think that, with less agar and a more spreadable texture, this could be used as a healthier alternative to vegan butter? How long can I store in the fridge in an air-tight container and also can i freeze it (already sliced or shred)? Just made this and it tastes amazing! I haven’t chilled it yet so don’t know about the sliceability, but at this point I couldn’t care less. It tastes that good. I wasn’t expecting it to be a big stretchy mass by the time I finished cooking it…. Is this the way it’s supposed to be? Great! It does get stiff because of the agar. Let it chill for a more set texture. You can adjust starch and agar for a texture you prefer. Hi richa! Big fan of a lot of your recipes!! A quick question tho, I can’t find agar ANYWHERE within like a 30 mile radius, so could I make the cheese without it? I know it would probably be runny and more saucy, but would it have any impact on the flavor? Yes, you can make it w/o Agar. It is only for setting the cheese and it does not change the flavor. Am going to make this cheese to shred into your Lentil-Vegetable Frittata from your Everyday Kitchen cookbook. I make the Chickpea Flour Vegetable Frittata 😋❣️frequently (doubling the recipe for a 13×9!) but haven’t tried the Lentil one yet. Should I keep the rolling boil going for the full 4 mins.? yes almost a rolling boil. This recipe looks incredible and I’m dying to make it! Only thing is, I don’t have chickpea flour. Is there another flour/starch or something else I could substitute? Thank you so much! This was my first homemade cheese and I will definitely be making it again. I like the flavour and have had it on pizza, crackers, toast. Mine turned out a solid but spreadable, too soft to grate. I could only find something called vege-gel to use as the gelling agent so might try to adjust the quantities a little to make it more firm next time, but it’s been great. Thanks for the recipe and comments! awesome! yes adjust the gelling agent to get to a grateable state. Should it go in the fridge covered or uncovered? Question!!! I accidentally added cashews to mine thinking it was like all the other recipes… Will this do anything? I just out it in the fridge and I’m waiting. Thank you!